Crispy on the outside, tender on the inside. Potato skins don't have to be unhealthy. A fantastic way to make potatoes. 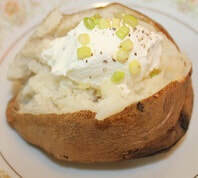 Moist and creamy inside with a crispy potato skin. Serve with your favorite toppings. Great recipe the kids will enjoy. Serve these cheesy potatoes for breakfast or dinner. A perfect alternative to mac and cheese. Tender on the inside but crispy on the outside, these grilled potatoes are a favorite. A colorful take on an Irish classic. 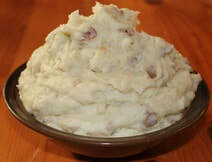 This wonderful tasting Colcannon recipe is a great alternative to regular mashed potatoes. Crispy french fries baked in the oven are a treat served hot. These fanned potatoes are a nice alternative to regular baked potatoes. They look complicated but are really quite easy. Fingerling potatoes are tender and sweet. These are simple and beautifully flavored. Roasting garlic is well worth the effort because of the extraordinary flavor. Start you day off with these crispy hash browned potatoes. Crispy on the outside, tender on the inside these roasted potatoes are easy and fabulous. Creamy, light mashed potatoes with a just hint of garlic and Parmesan cheese make this recipe special. Potato wedges with a hint of Parmesan are tender on the inside and crispy on the outside. These potatoes taste amazing and they make a beautiful presentation. 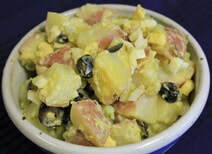 Creamy, crunchy potato salad, brings back memories of potlucks and barbecues. These savory mashed potatoes have sauteed onions and garlic for added flavor. Creamy decadent tasting scalloped potatoes are easy to make and healthy too. 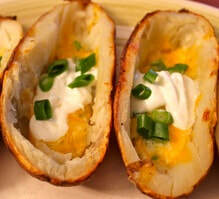 Turn ordinary baked potatoes into a delicious, healthy side dish.